A blog about Wine, Food and everything in between. 1. AW: Congratulations on the win at the Monticello Cup! You had four wines place in the competition with the 08 Petite Verdot winning overall, Meritage 07 receiving gold, and the 08 Merlot and 09 Viognier winning Silver. With these representing three different vintages, how much did vintage variation play in the distinction of these wines. 2. AW: This was a competition of your “direct peers”. How do you feel these wines would hold up on the national/international scale? 3. AW: I would assume that you go into a competition expecting to win, but were these the results you expected? 4. AW: As a continuation of question #3, of the wines you submitted, did you expect to win overall with the 2008 Petite Verdot? 5. AW: Some winemakers have said that PV will take the reigns as VA’s red grape and surpass the quality that Cab Franc has shown. Do you think this to be the case? 6. 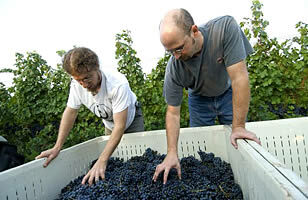 AW: With the up and down start to the 2010 growing season, how is the vintage shaping up? JB: “My standard answer to this question is “Ask me in December”. Beyond that, the vineyard is off to a great start and a touch ahead of where we were this time last year. I am ever hopeful, of course…”.